Previously, Universal Studios released concept art for its upcoming Super Nintendo World. 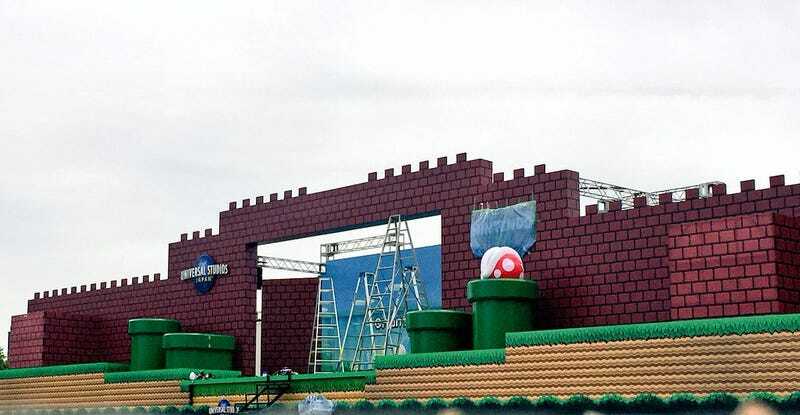 This week at Universal Studios Japan in Osaka, a large Mario-themed stage appeared in the parking lot, giving a more concrete look at what to expect. These photos were snapped by Twitter user and USJ super fan LCASTUDIOS_USJ. It’s believed that the stage was created for some sort of event related to Universal’s Super Nintendo World. Completion of the actual area is still years away. These photos seem to show how construction is going at USJ. And some more photos from earlier this spring. As you can see, it’s still early. USJ’s Super Nintendo World area probably won’t be opened until 2020.